I am so excited to introduce a new feature on AphroChic! It’s called “On the Hunt”, and it’s an opportunity to help you find furniture and decor that you may have spotted in a magazine, online, or even in your favorite movie or TV show. All you have to do is drop me a line, let me know the item you’re looking for and where you first saw it, and then I will track it (or something similar) down just for you. 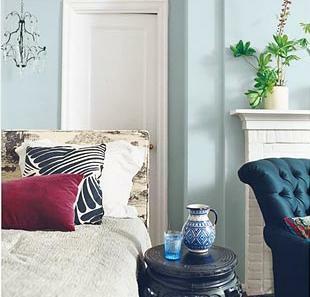 Last week, I moved into my studio apartment and I went on dominomag.com to [find] some inspirations to decorate my new place. The online magazine did a feature on Rashida Jones’ tiny apartment and I love her sofa. 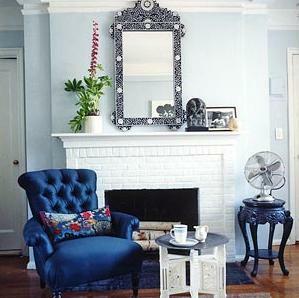 Can you help me [find] where to buy the sofa, mirror, headboard and the side table next to the fireplace? 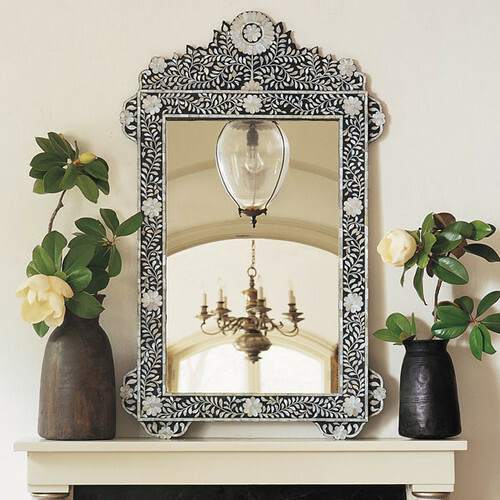 This Inlaid and Mother-of-Pearl Flower Mirror can be found at Wisteria. A beautiful accent piece to simple black and white decor, it will look beautiful over a fireplace or entry table in your new apartment. 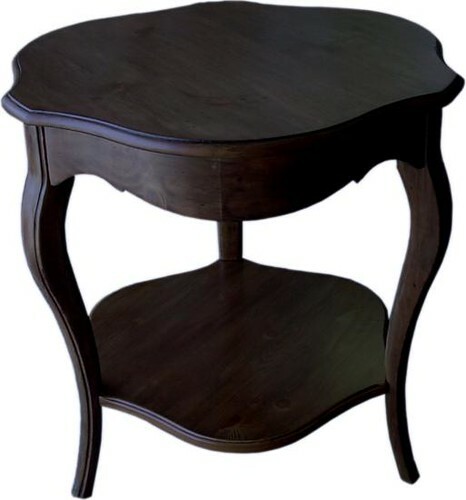 I couldn’t find the exact side table in Rashida’s apartment, but this Isabelle Side Table from Lamps Plus (not many people know they also sell furniture) is similar with its graceful style and curvy lines. There are so many choices for upholstered beds out there, but the Cara Bed from Z Gallerie is very similar to the one featured in Rashida’s apartment. Beautifully tailored with nailhead accents, you can leave this bed as is, or get it recovered in a toile fabric like Rashida did. Finally, Rashida’s classic sofa is quite a find. 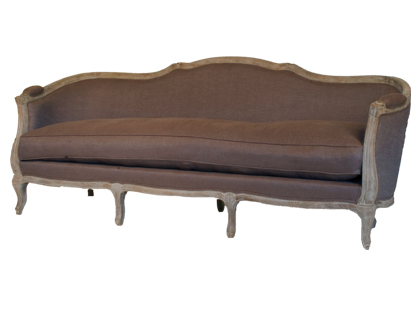 Similar sofas can be found at Anthropologie, Horchow, and Ballard Designs, but I am partial to the Amalfi Sofa at Jayson Home and Garden. 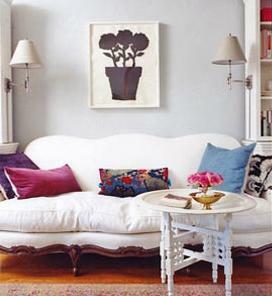 A gorgeous frame in a neutral gray upholstery, this sofa can be easily reupholstered in off-white. So much of the fun in decorating is the hunt for the perfect piece. Let me help you find something amazing, and submit your “On the Hunt” request to aphrochicblog@yahoo.com. Oh Yeah! I dig this new feature. Rashida seems like a cool chick. What a great new feature! Love it and can’t wait to read future OTH posts! great new feature! and what a coincidence – i was just looking through this issue of domino with rashida’s place in it today…to get some ideas for small spaces :o)tip – for the sofa try doing craigslist searches for ‘french provincial sofas’ they are usually easy to find – same lines and feel and they you can just have it recovered it if you don’t like the fabric! and they are usually reasonably priced – i’ve seen ’em for as low as $100! 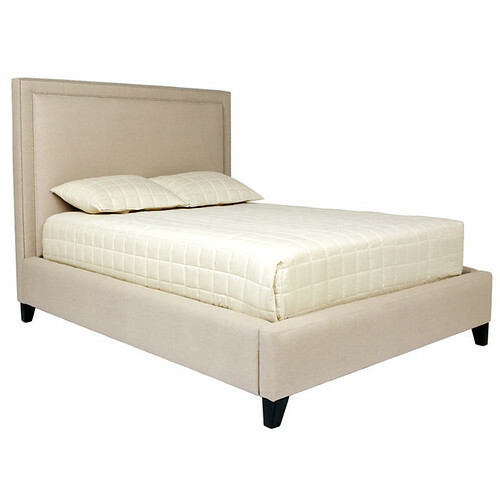 rashida’s bed is a full-size custom daybed style. the headboard and footboard are the same size and covered in toile. I LOVE LOVE LOVE that white sofa..it’s elegant and most importantly it looks comfy at the same time!!!!!!!!! Those are antique Chinese plant stands and you can find them everywhere- the internet (http://asian.oneofakindantiques.com/, tealan, overstock, ebay), flea market… my mom’s house. They are all incredibly handsome in construction and full of personality. It looks as though they laid a matte finish over it… you don’t typically see them with a blue/black coat. Yeah, I can’t ever get enough of her studio. I’ve been hunting for those criss cross (gateleg?) tables she has… I can’t find them anywhere. I love the concavity of the top. I just love this post. She is one of my favorites, and her home is just gorgeous!